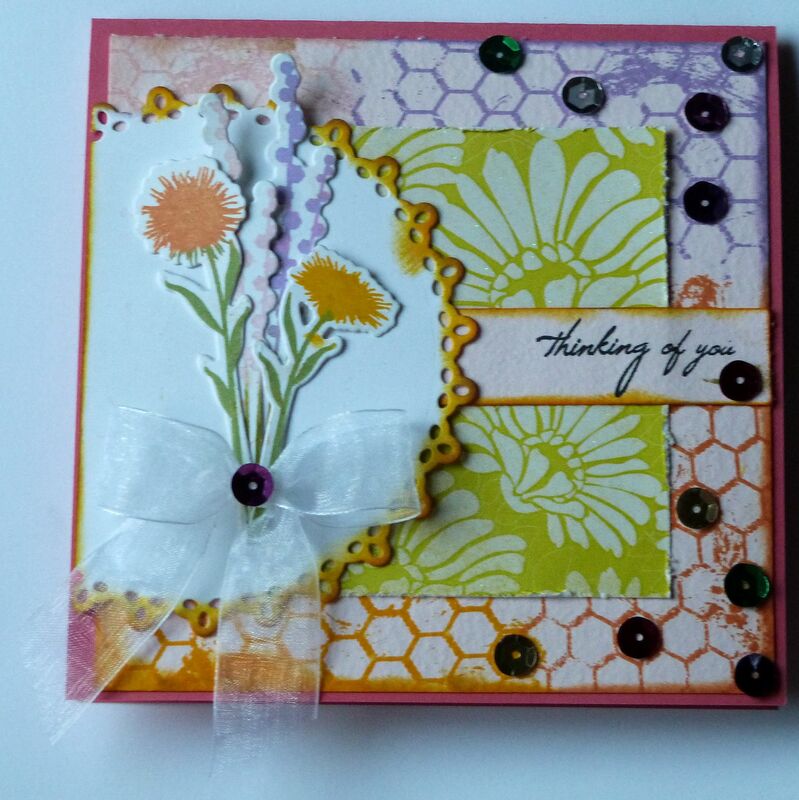 I enjoyed making this card using MFT sketch 188. For all my panels and different elements on the card I used different dies from blueprints 3,11,15. 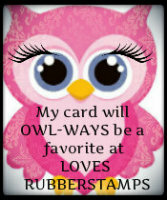 Stamp is from MFT. The background I used Hero Arts leaf and flourish stencil with versamark ink and I embossed it with Recollections clear gold- sparkle embossing powder, loved how it looks all shiny. On the flag panel I added Large background diamonds in stripe fashion and then added the LGD strips under and over the sentiment and embossed that too. 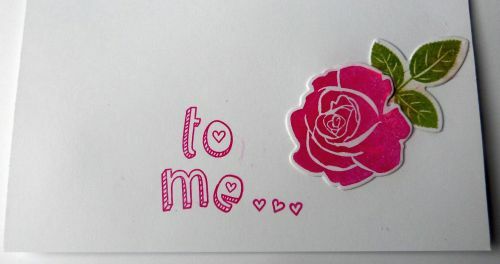 Love the flower all stickled up for shine, with the rose leaf die, the heart in the corner was cut from an embossed felt. I added some sequins. Love how the inside came out. 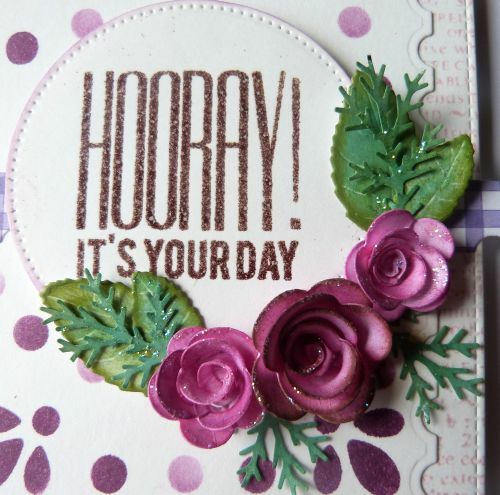 I am also adding this to Loves rubber stamp- out of season card and Simon says stamp- make it sparkle(all the sparkle started with this challenge), A blog named Hero- Die a little and Word art Wednesday- anything goes. so here is the actual card I had made for the challenge MFT 186. THis is a 5.5 x 5.5 card as I felt the word Happy needed it’s space. 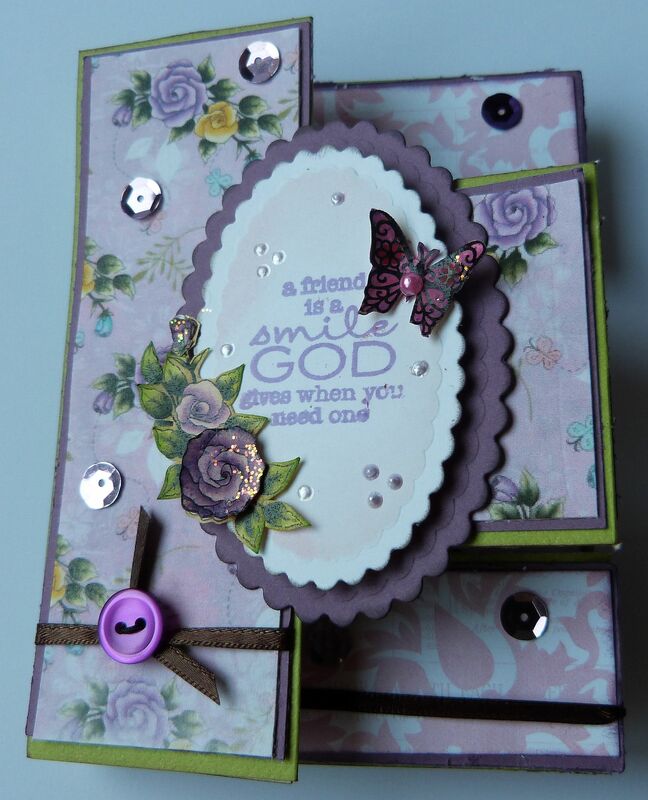 I love how this card looks, the stamps and die is awesome. 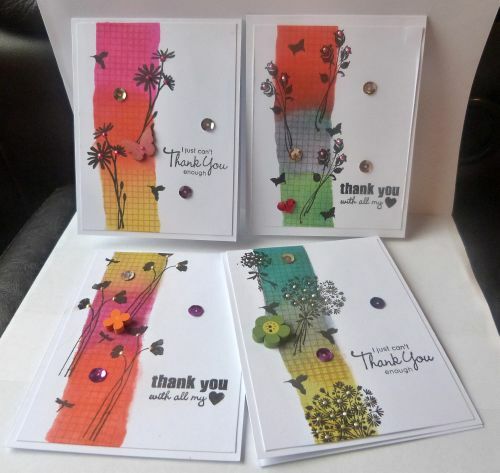 I have also used MFT stencil the stripes and i used 3 MFT inks for it- bubblegum, blu raspberry and lemon drop. I distressed the edges with antique linen. I also have dry embossed one panel. I had started with July color palette of MFT but then strayed as i added layers. 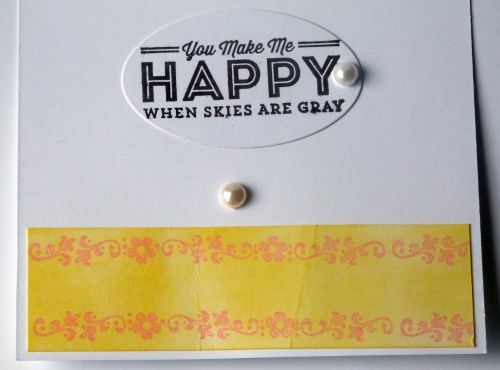 The word happy was cut in three layers and then added a coat of glossy accents on the top. The rolled roses have stickles on the top. The swirl is from zva pearls. 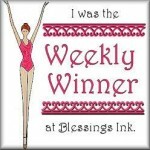 I am entering it in Simon Says Stamp- anything goes; Word art wednesday- anything goes. I used MFT sketch 181 for this birthday card. 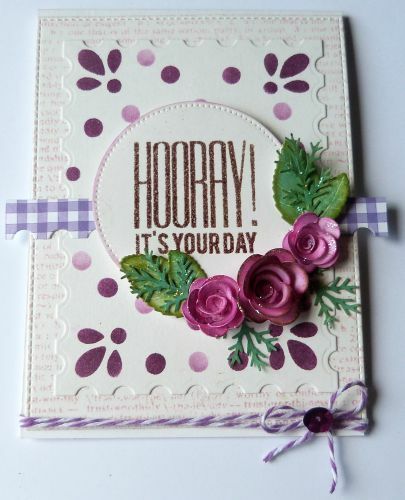 The card is for someone who likes purple, so I used pink and purple as my combo and love how it looks together. I started with a 4.25 x 5.5 card but later changed to 4×5.5. I used MFT blueprint 3 and 13 for my panels/ the first rectangle was cut and then stamped with Hero Arts friend stamp with spun sugar Distress INk(DI). I then cut a postage stamp die and added MFT-MPD delicate doily stencils with seedless preserves, to create the lighter shade dots I rubbed off some ink on scrap paper and then continued the stencilling. I did not follow the pattern of the stencil but moved it around to suit my paper. I cut the circle panel and embossed it with purple black embossing powder. The sentiment is from MFT birthday greetings. the border behind is from notched tag border in this sweet gingham paper I had in my stash. I cut a few rolled roses, colored them wiht seedless preserves and pickled raspberry DI, peeled paint and evergreen DI for the Rose leaves and Martha Stewart punched leaves. As a last touch I added stardust stickles. The card still looked incomplete so I added twine and sequins at the bottom. Perfect! 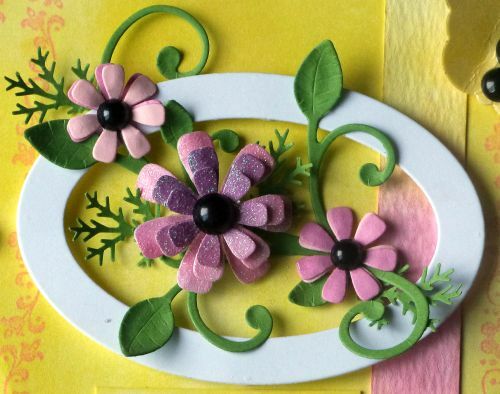 Here is a close up of the embossing and flowers. They look gorgeous IRL. here is the inside, I love the look of All the Movies sentiments. 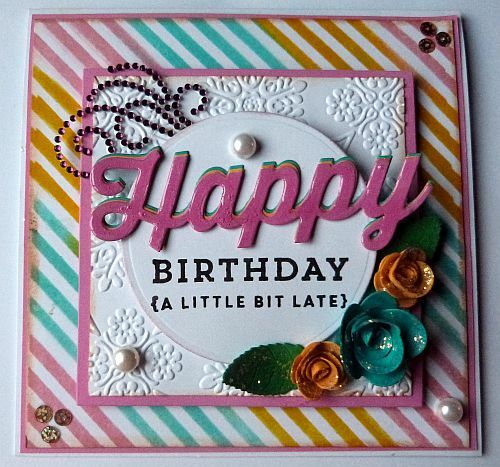 I am also entering this card in Loves Rubber Stamps– Spots and dots; Word Art Wednesday- Anything goes; Wow Emossing powder– Gardens and 613 Avenue– Anything goes-add pink. I made this card for my mom for Mother’s day yesterday. I wish all mom a Happy Mother’s Day throughout the year. 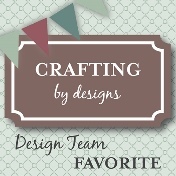 I love KittieKraft’s cards, so when I saw the oval in sketch MFT-175, I knew I was trying to do something similar to her style. I first sponged the background with squeezed lemonade distress ink and then added the two border on the side with MFT-cotton candy ink. The border is from Recollections(garage sale bargain).then I added as trip colored with both inks. I popped the oval cut from Blueprint- 3 and added the leafy flourish. 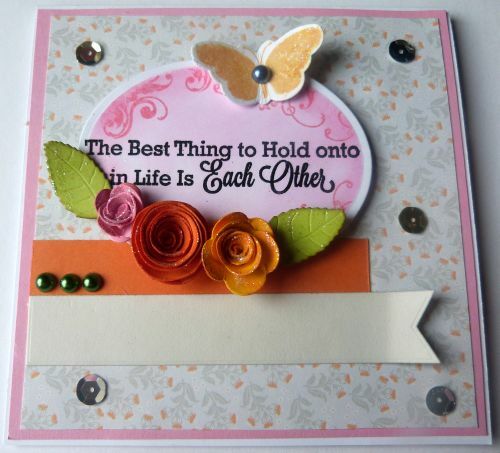 I die cut the MFT trio flowers in different shades of pink and dry embossed them from the back. to make it fuller I added some punched leaves from Martha Stewart. I love how it adds to the look. Added some white and black pearls, a lace and butterfly form LJD blissful butterflies. The sentiment is MFT- from the T-shirt set. 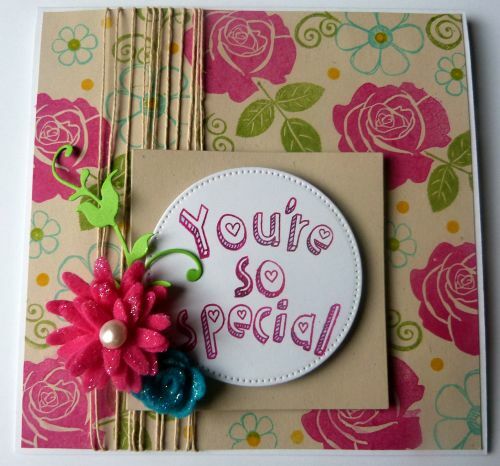 The inside has a beautiful sentiment and more of the sponged paper with a border. 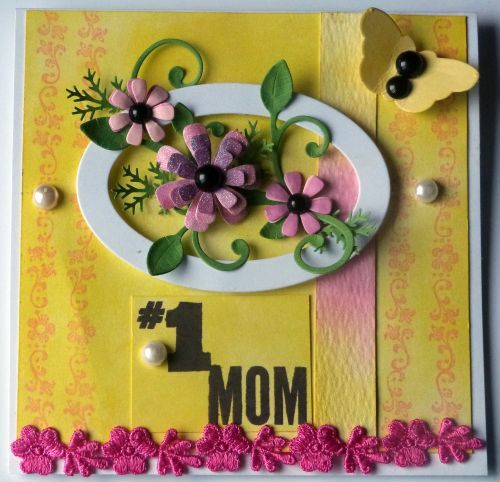 I am also entering it in Simon Says Stamp– Spring Flowers; Loves Rubber Stamp– Anything goes Ribbon Carousel– Party time(celebrating mother’s Day) and Whimsy Stamps– two or more diecuts. My daughter’s student teacher was leaving and we got her some gifts, my daughter was thrilled when I asked if she wanted me to create a thank you set for her. So here is the set, I had seen this technique on Pinterest and wanted to create it for some time, I used distress inks, sponges, some Technique Tuesday stamp, love the details it offers for little scenes and Inkadinkado stamps. All of them have little additions of liquid pearls and my fav- sequins. Some have wooden flowers, butterfly or sequins created into a heart. Here is each one seperate with the matching envelope. TO create each card I tore a piece of paper and stuck it with post it notes to create a space in between, used distress inks to sponge colors, some colors are different as they blended into each other. 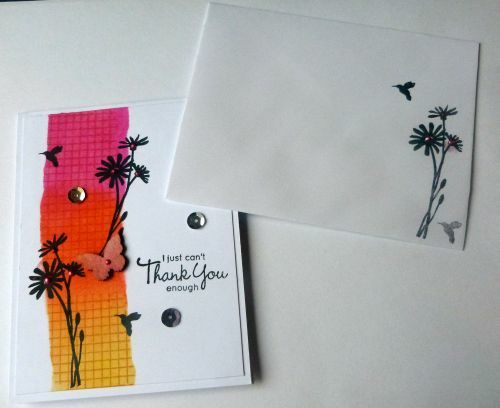 The I stamped a grid pattern from Verve on them with wild honey distress ink. Removed the paper and stamped with black versafine ink. Sentiments are from MFT. 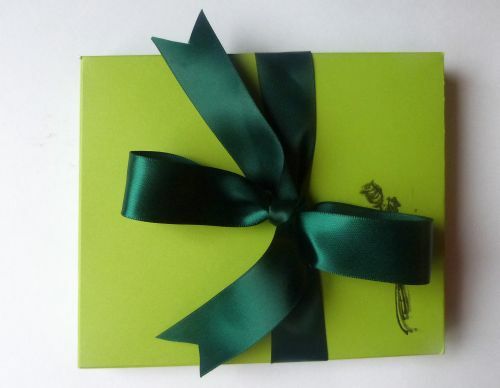 Here they are in a box made with W R Memory envelope punch board. 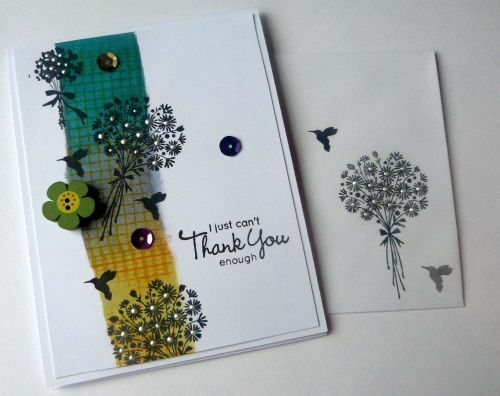 I am entering it in Simon Says Stamp– Clean and Simple; Use Your Stuff– flowers; Stamp and Create- Say it with words; Addicted to Stamps- things with wings and Word Art Wednesday– Anything goes. Thank you for visiting and your sweet comments. I made this using MFT sketch 172. I heat embossed the sentiment on oval stax. Then left the die in place and used worn lipstick Distress ink, added finishing flurishes with the same. Add it with pop dots. Did the trio of flowers using mini roses and rolled flower. Added rose leaves. lots of stickles. 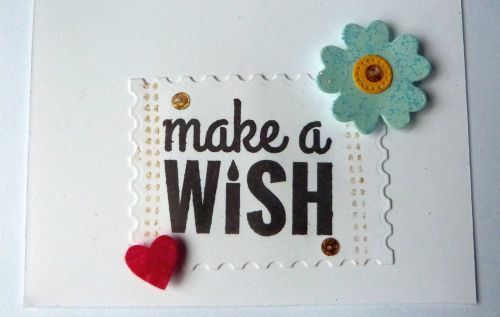 Plain cardstock, sentiment is MFT. 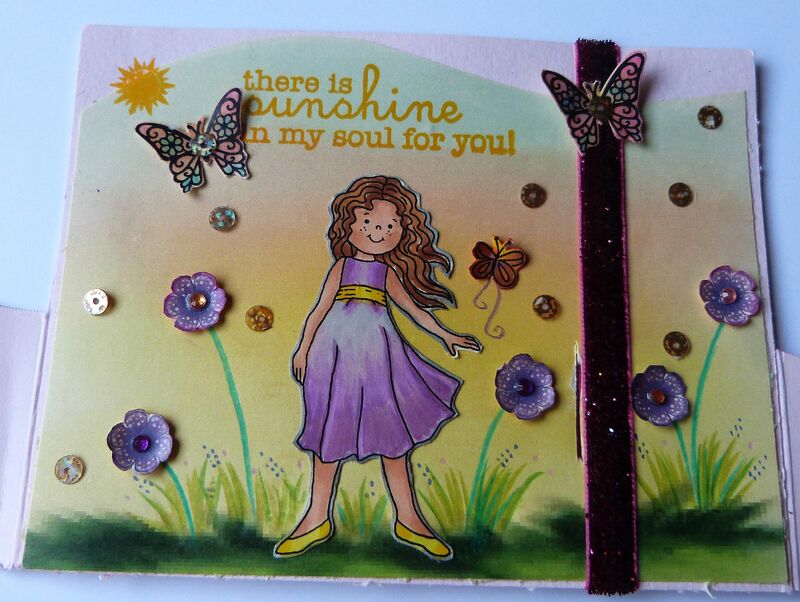 Added butterfly from Blissful butterflies in scattered straw DI. To finisih off i added some gems and sequins. here is a close up of the flowers and the inside. 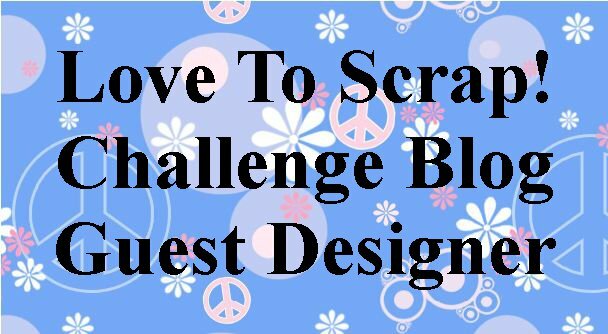 I am also adding this to Simon Says Stamp- animal Antics; Crafty Calendar Challenge– Things with wings; Colors used are from the Doodle Garden challenge; and Word Art Wednesday– anything goes. I loved this color combo of natural, blu raspberry, razzle berry and gumdrop green. 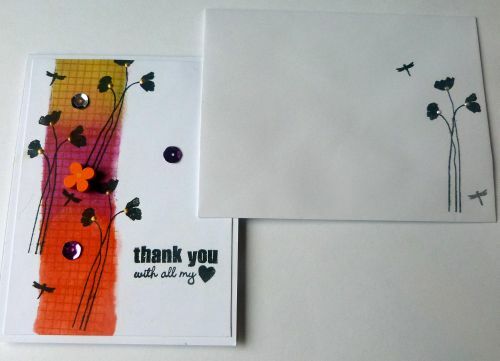 I used those MFT inks to do my background on natural cardstock. The sets are MFT MPD rose and pretty posies(love this set). I added a little yellow for interest. For the long panel I added hemp cord keeping with the natural feel. Then I added the square on pop dots, the pierced circle is from Blueprint. 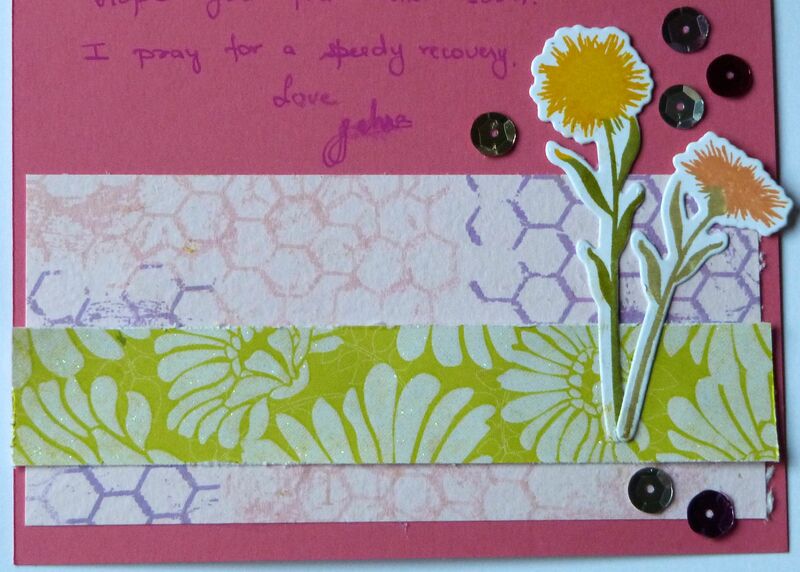 I added a felt rolled daisy and mini rose with some stickles for shine. 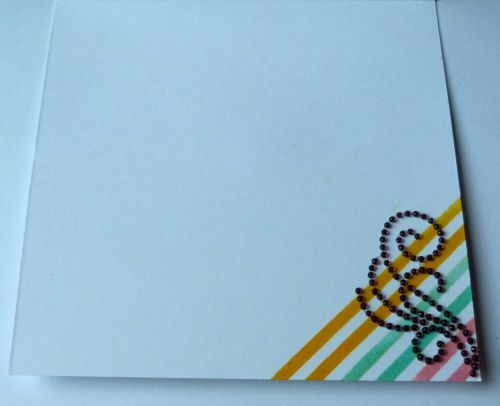 Added a leafy flourish and pearl to finish the card. 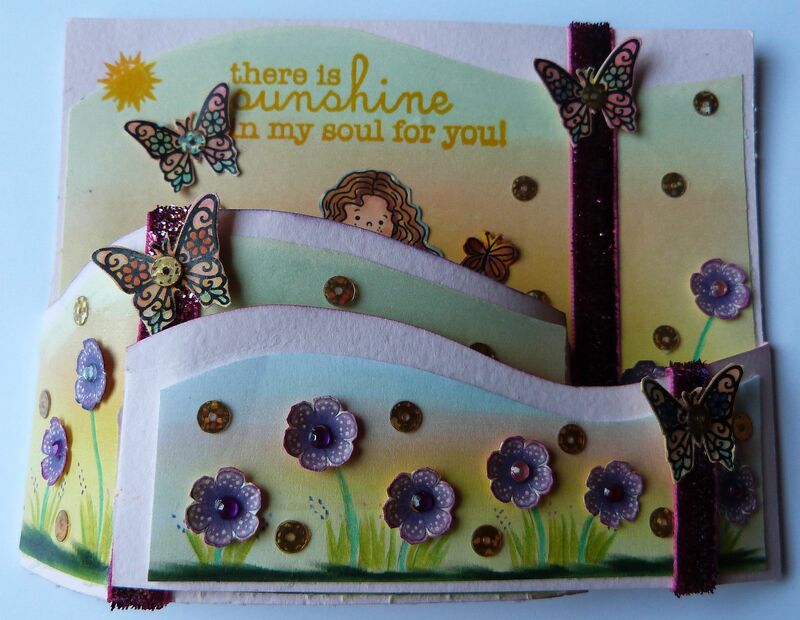 Sentiment is from Wendy burns stamp. 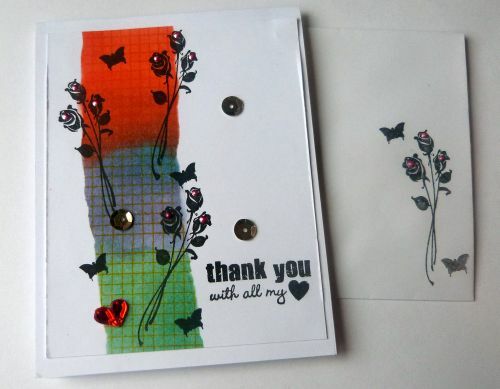 I am also adding it to Whimsy Stamps- anything goes and Hobby Cutz– Bongo- diagnol row of flower, stampand diecut. 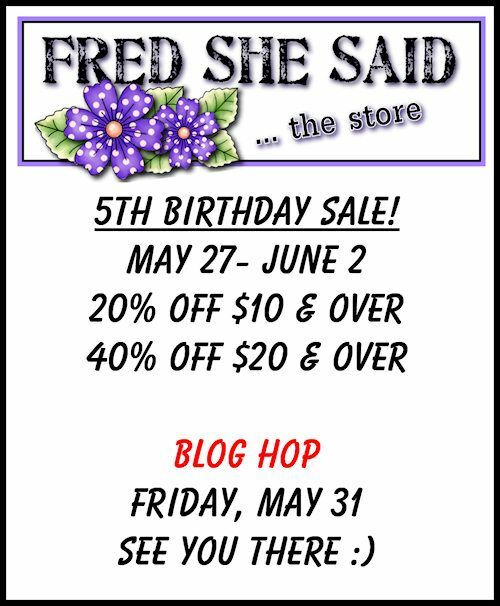 Fred She Said is having a sale from Monday May 27th until June 2nd! 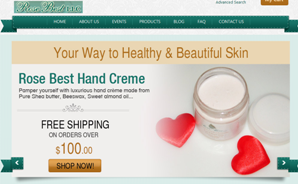 20% off orders $10 and over and 40% off orders $20 and over! If you have arrived from Patty’s blog, you are right on track. 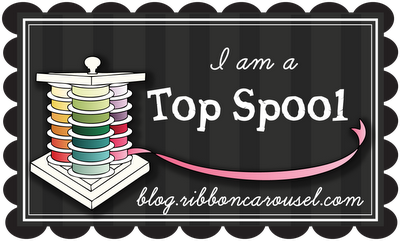 If you are just happening by, you will want to start on the FSS Blog. 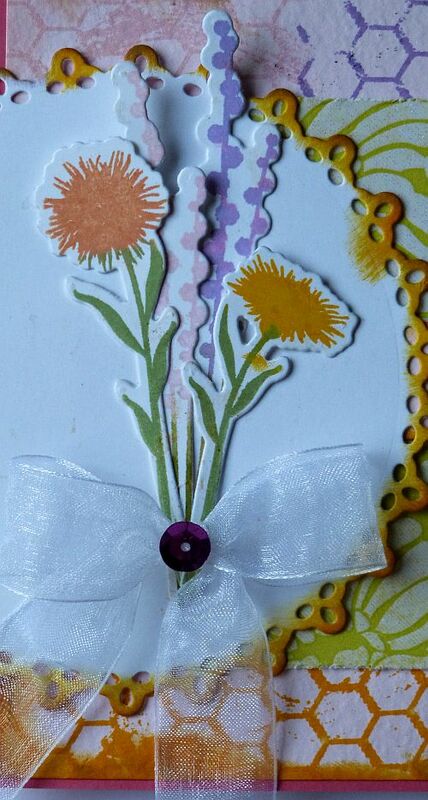 Now onto my cards, Yes there are so many flowers, I could not stop at one. The first one is a tri-shutter card. Here is the tutorial. I have used several Fred she Said flowers on it. The background paper is Summer Roses, the pink paper is from my scrap. I have used the pre colored rose spray surrounding the sentiment from the and the individaul roses colored in copics from the rose spray and candle and my favorite ornate butterflies. Everything is distressed with distress inks and the sentiments are from MFT- cheerful blessings and Chalkboard greeetings inked with MFT ink. I have lately been on a sequins kick, love the look so I added a few. I can’t believe that I have had them forever and have not been using them. The roses have stickles on it, the butterflies have pearls and I added some ribbon and a button. The main sentiment also has liquid pearls in lavender lace. Oval was cut with Spellbinders Dies. 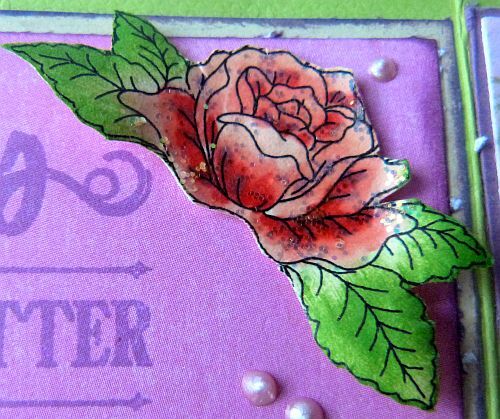 Close up of the rose colored with copics and leaves colored with mowed lawn distress ink. The next card is a bendi fold card. Here is the tutorial. This looks awesome in real life. I have used Fred She said flowers again, I used the pre colored New Happy flowers, sized them to 1/2 inch and used a emboss stylus to round them added distress inks on the sides to bring them out. Isn’t the Background fabulous, it is a FRED SHE SAID background, one Tracey threw in for free when you get the Wedding Emma, love it. Just size it what you want, here I have one that is 1.5 x 4.2; 5.5 x 4.5 and 3.5 x 4.2 and then cut as needed. I added some grass with prisma pencils, added some lavender stalks with pencils, added some sequins to the middle and again sequins, told you it is just fun. I added ribbons near the slits to make it neat and added again the ornate butterflies, all colored with copics and distress inks. here it is open one layer, I know the back needs to be neater, I am going to add a backing to it all. and here it is open all the way. Isn’t Emma and the butterfly so sweet, she is colored with copics, sentiment is MFT again inked with MFT inks. Sequins, happy flowers, ribbon and ornate Butterflies. 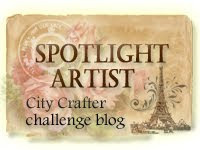 Your next stop on the hop is FSS challenge blog. I used MFT sketch 122. I made this hoping it will cheer someone up. I used MFT stamps- Mona Pendelton distressed backgrounds, i used the chicken wire in four MFT ink- pink Lemonade- lemon drop, grape jelly and orange Fizz. love how rich the colors are. and i stamped the sentiment in black licorice. I love the font of this set- LJD peaceful wildflowers. it is dainty and just lovely. I used the stamp and die. I added a ribbon and some sequins. I also used Quic kutz doily for the circle. 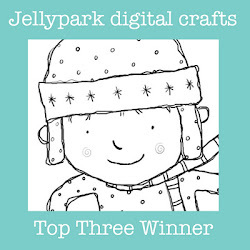 Country View Craft’s challenge– How does your garden grow? 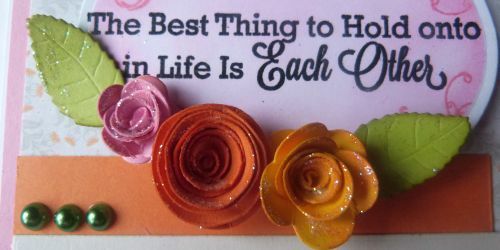 Crafty Bloggers network– matches 3 rows-vertical-diecut, flowers ribbon. 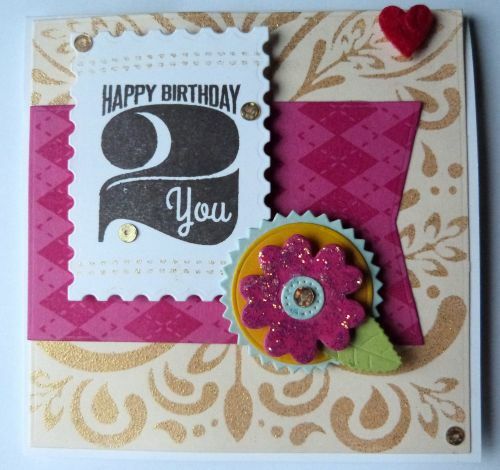 Horizontal-Die cut, doily, bling andother vertical- Doily stamps and sentiment.